Do you remember that moment as you find a nice chest somehwere but then you realize that you don't have any lockpicks left in your pocket? And the next moment some other player appears and loots this chest right in front of you? 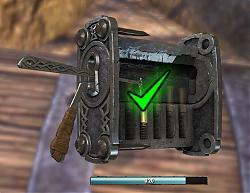 This simple addon gives you the possibility to colorize the "lockpicks left" information that you see at the bottom line, if you are lockpicking a chest. The colors can be changed according to a number of lockpicks that you have left in your inventory (threshold values). The next chest you will lockpick will give you the visual information now, if you need to get some new lockpicks to your pocket. A green check icon will be shown each time a chamber of the current lockpick progress was picked and you need to release your mouse button! And you are able to colorize the lock's springs green as they get resolved. This addon comes with a settings menu LAM 2.0. No other features so far. If you wish other features use the addon feature/bugs panel please. Check the description for infformation what a library is, what a standalone library is, what other addons are helping you to see the dependent libraries of an addon, and how you are able to install them properly as a standalone version. Hopefully fixed: Working within gamepad mode now. -> Thanks to Trent Apple for the fix! If the lockpicking starts the chat window will be minimized and after lockpicking it will be set to the state before. -Updated french translations. Many thanks to Chou for the help! I'l have a look why the checkmark won't be shown. I've disabled all other addons except FCO Lockpicker and the two libraries that are required. Still not working for me. I'm not using a gamepad or using Advanced Disable controller UI. I've tried it on another character too, same result. No green check marks. Have you any other ideas? Thank you. FCO Lockpicker is no longer working since 4.3. I have the Libs required properly installed but no checkmarks. Thank you so much for this addon. Are you using any other addons related to lockpicking or are you playing with a gamepad in gamepad mode, or using the addon Advanced Disable Controller UI? If so: FCOLockpicker is not compatible with gamepad mode and/or this addon! Please disable ALL other addons except the libraries and test agin. Does it work then? Enable the other addons from before one after another and tell me which breaks it then. Maybe I can fix it then. Last edited by Baertram : 04/22/19 at 11:59 PM. Last edited by DarkAthena76 : 04/22/19 at 05:40 PM. Last edited by DarkAthena76 : 04/15/19 at 04:43 PM. So not sure what the reason is, but I have your addon installed, I have the current LibStub and LibAddonMenu-2.0 installed in the addons folder, but after logging into the game, the addon does not load. The popup does not show LibAddonMenu-2.0 so it is not enabled and/or installed properly! Check the c:\users\windows username\documents\Elder Scrolls Online\live\AddOns folder if there is a folder called LibAddonMenu-2.0, containing a LibAddonMenu-2.0.txt and another subfolder LibAddonMenu-2.0 and a subfolder LibStub. Be sure to enable this library within the ingame addon manager. Install the addon "Votans Addon List" please and check if the library LibAddonMenu-2.0 is shown at the bottom of the addon manager list (click on the "Scroll to libraries" button at the top of the list to get there). From your screenshot I can see that you already got Votan's Addon List enabled (maybe by one of his addons which contain it already). So update the version via Minion please so that you got the newest version. Then just click the checkbox of FCOLockpicker and it should autoamtically enable the dependent libraries if they are installed properly. If this does not work you got an older version of Votans Addon List, or you are missing the correctly installed library. Ok all fixed now. As you mentioned, it wasnt the fact that I didnt have LibAddonMenu-2.0 installed, but how it was installed. Once I got all LibAddonMenu-2.0's files to their correct location in folders/subfolders, I restarted my game and now it works as intended. Thanks for the help and great work on the addon btw. Last edited by Break977 : 10/14/18 at 07:05 PM. Last edited by Baertram : 10/14/18 at 02:54 PM. Last edited by Break977 : 10/14/18 at 07:04 PM. Thanks for the feedback. I'm glad the addon also helps the players by "real means" and not only to be "lazy"
I just wanted to say well done for a great addon and keep up the good work. My wife is an avid ESO junkie but she is almost legally blind in both eyes. If it wasn't for your addon she would have no hope of picking locks. Anyone that says this addon gives an "unfair advantage" needs to take a good look at themselves because this addon levels the playing field for those visually impaired players in our ESO community. I approve of the idea of having only one copy of a lib. Would it be possible to have a "_Libs" folder within the AddOns folder? To keep it a bit more clean? And would it be a good idea to butcher other AddOns using the same libs by removing them there and adjusting the <addonname>.txt to point to the new path? Or would it be better to just remove the entries there and put a new "_Libs.txt" in the rootfolder pointing to all the libs i want to load? 1 update of any lib wil lneed you to update the whole addon with all content again! This is NOT what a library is designed for. Libraries are designed to be a standalone piece of code which can be updated and maintained without any dependency to other addons. You will just have to update the single library and nothing else, which will make it smooth and fast to maintain, and wil laffect all addons using this lib automatically afterwards! This is not possible at all. How should I tell my addon to remove other addon's folders and point to my addon's folder via there txt file? If ppl do not use my addon the txt file will point to a wrong path. And it is the same as it works today: All addons using standalone libs do not point to any library folder but simply find the libs via LibStub, as the lib* folders got their own txt file which will let the game know where the libraries are. The libs are installed like normal addons and therefor are in their folder called Lib*. I don't get what the problem will be there? You talk again about putting libraries into the addons dir. This is NOT the way libraries are build. They should be kept as standalone and updated like normal addons ion ONE SINGLE place, and not in every subfolder of about 100 addons you got installed. -Only 1 lib* folder for each used library to update (via Minion or if you do not want to use Minion manually. If the library did not update but the game's API did you'll just have to enable "Use out of date addons" ingame in the addon manager or edit the Lib*.txt file in the lib* folders to update teh API number behind ##'APIVersion: 100025 e.g.). -No copies of libraries inside addons subfolders which will make the loading of the game slower and use space on your harddrive/SSD. Upload them to ESOUI and and and. Post changelogs about changed libraries and no changes in the addon. If a lib was not tested properly and destroy the game somehow Ppl will NOT ask the addon devs of the addons where the lib was included anymore about help as they don't have to do with the libraries and only use them e.g. The eso lua error message will point to the lib* folder's lib*.lua file and you will know it's about the library then, and not the addon. Im very sorry. That was not supposed to sound like a feature request. I knew it was only a question, no feature request. Just wanted to answer with a bit more detail about this as there are many users asking similar questions in the past weeks. Maybe it will be a text someone else finds and will read as well. Last edited by Baertram : 09/26/18 at 11:08 AM. Last edited by Baertram : 09/26/18 at 07:04 AM. Thank you that seemed to fix it! Ok, thanks for the test. Will investigate where it comes from and fix it if possible. I had Chat Window Manager and FCOLockpicker both running ONLY and picked a door and the chat window opened up. I reloaded with ONLY FCO Lockpicker running alone and picked the same door and the chat window opened. Using pChat and got no problems with the chat and FCOLockPicker. What if you disable Chat Window Manager and just use pChat and FCOLockPicker at a chest (please disable ALL other addons for the test) and after that without even pChat. Is the chat then hiding (if not already hidden) and getting back to the position before the lockpick (hidden or not) properly? Yes. It is hidden off my screen! I do use pChat and Chat Window Manager though, for chat related stuff? The chat window state should be reset to the state before lockpicking, not always maximized. Is your chat definately minimized before the lockpicking starts?